Blu-Ray Review: ‘Mad Max: Fury Road’ (2D Version)!! It’s a damn shame that every action movie can’t be as good as ‘Mad Max: Fury Road‘. So many action films will try, but will ultimately fail for a variety of reasons. Pure action filmmaking and movies just don’t get better than this movie. ‘Fury Road‘ is a troubled story to say the least. Original creator George Miller who made the original three ‘Mad Max‘ films had the idea for this fourth installment back in 1998. That’s 17-years ago. This project wasn’t necessarily put on a hold shelf, but a few things had happened to delay the film from being made. From 9-11 to foreign policy, to Mel Gibson’s infamous arrest, there were a variety of things that prevented this movie from seeing the light of day. Years went by and George Miller went on to make ‘Happy Feet‘, which is a far world away from the likes of these ‘Mad Max‘ films. However, the script showed up again and some rewrites happened, and Miller got all excited again, hence this new film. At first, Miller wanted Gibson back in the iconic role, but both he and Miller decided to revamp the series and go with a different cast and angle. That pretty much brings us to ‘Fury Road‘, starring Tom Hardy as Mad Max. Make no mistake about it, this film is epic in every way and I don’t say that lightly. It’s a rare occasion where I get overly excited for a movie and have the highest form of expectations, when after viewing said film, it meets and exceeds all these expectations. That’s the case with ‘Fury Road‘. Not only did George Miller build on this post-apocalyptic universe, he also made one of the best action films I’ve literally ever seen, with mostly using practical effects and not CG. There is really zero down time in this film. From start to finish, something big is happening on screen, which doesn’t allow you necessarily to get one breath in, let alone blink your eyes. What I like about this film, is while it’s a remake, it doesn’t need to spend any time with a backstory for Mad Max. Miller knew that almost all of us would know the general gist of the story going into it, hence we are thrown in straight to the action from scene one. 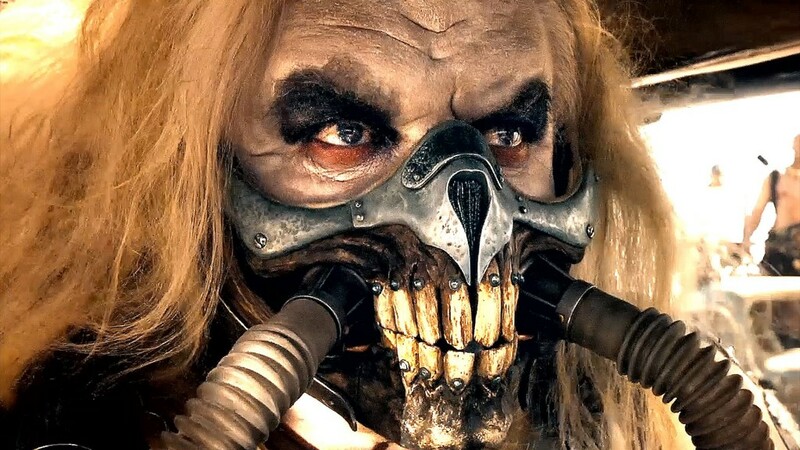 Max (Tom Hardy) escapes the grasp of an evil monster of a leader named King Immortan Joe, who enslaves the poor people below him and keeps all the precious and rare water for himself. 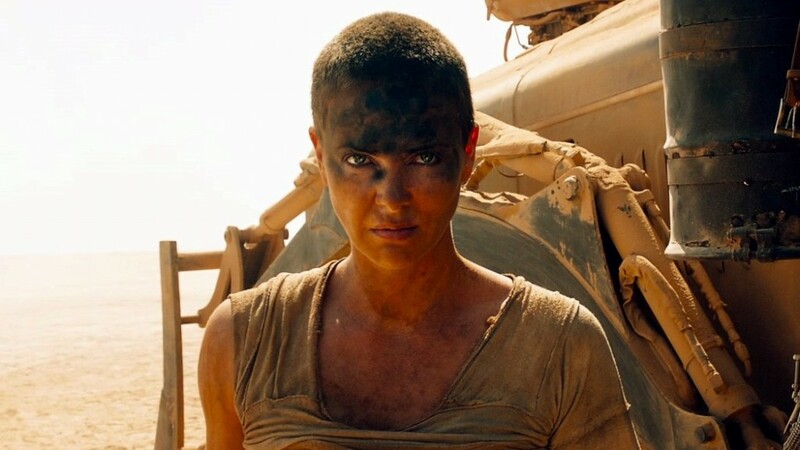 Max crosses paths with Furiosa (a badass Charlize Theron), who is taking five women who were impregnated by King Joe to a better place to live. King Joe doesn’t like this one bit, so he takes his insane minions, and all of their weaponized vehicles, along with a few other war lord gangs, and chases after Max and these women. These car chase sequences and fight scenes are legendary. Each and every one of the 150 stunt men and women earn their pay check the more with the chaotic stunts that are shown here. Plus, Max more or less takes a back seat here, where Furiosa and the other women show that they can handle themselves in any situation, however, Mad Max for sure earns that name here. This is the purest form of action, which each character and story told through very little dialogue, but somehow through the intense battle sequences and their facial expressions, you bond with them. Nicholas Hoult plays one of the minions named Nux, and he’s unreal in this role. I can’t believe the little kid from ‘About a Boy‘ turned into this amazing character. ‘Mad Max: Fury Road‘ really has it all in the form of action, explosions, gun battles, chainsaws, and vehicle chases. There is so much happening on screen, that you’ll have to go back for a second time to catch it all. I just wish that other filmmakers who were making an action movie would take notes here and follow suit, because this is exactly how to make a movie. 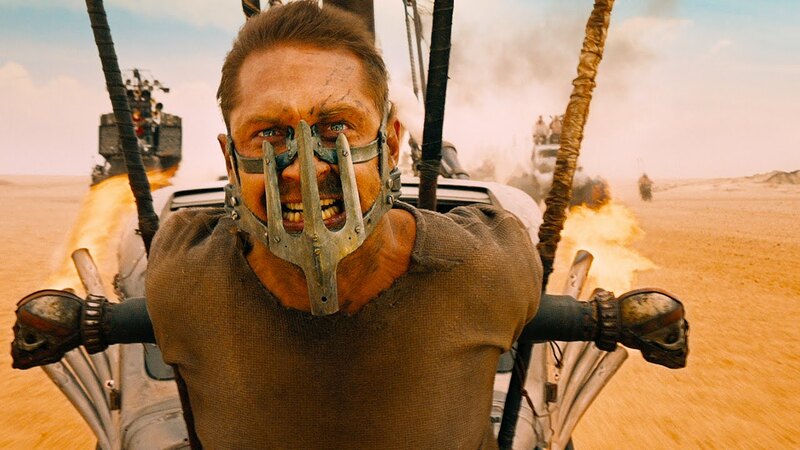 ‘Mad Max: Fury Road’ is the ultimate action movie, and I don’t see that changing any time soon. 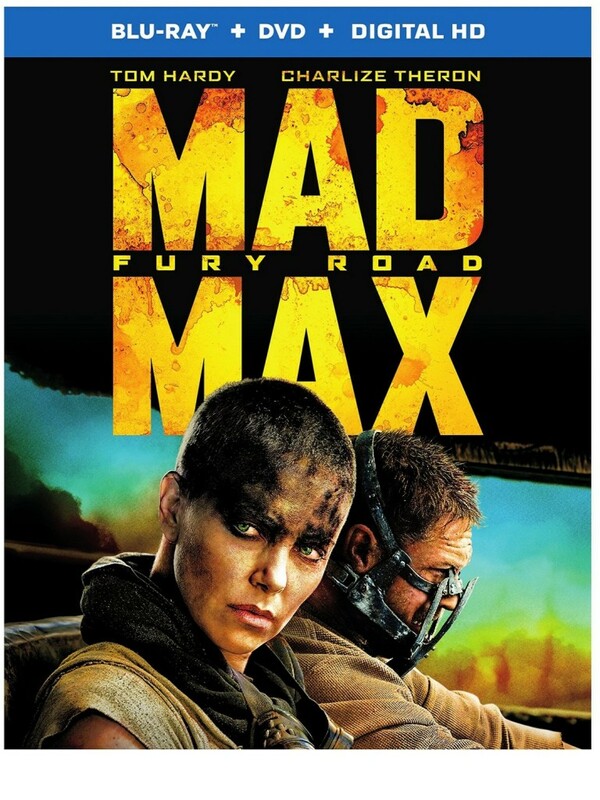 ‘Mad Max: Fury Road‘ (2D Version) comes with a fantastic 1080p HD transfer and is presented in 2.40:1 aspect ratio. This image simply looks gorgeous in every way shape and form. It just doesn’t get better than this. Every aspect of this image is flawless. The detail is always sharp and vivid throughout. You’ll be able to see each grain of sand being kicked up from the vehicles as well as every bead of sweat, bubble of blood, and imperfection on the war boys. Every ounce of rust and dent shows clearly as well on the vehicles. Costumes show fine textures with tons of scuff marks very nicely as well. Pretty much, you’ll be able to see every tiny detail that was put into this film here. Colors simply pop off screen as well. There isn’t much green, but the skies are bright blue and the sand is bright orange, giving this film a natural, yet war-torn look. Even in the heavier action sequences here there is a ton of dust and sand kicked up, nothing ever bleeds over or becomes pixelated. It always stays strong and bold throughout. Black levels are very deep and inky, with no evidence of purple hues or crush. The skin tones are always natural as well. There were zero instances of any aliasing, banding, or any other type of video noise, leaving this video presentation with excellent marks. If the above video presentation wasn’t good enough, then this audio mix will surely be. There are several different options here, one being a Dolby Atmos mix, however, I’m sure most of you won’t have the Atmos set up yet, but if you do, prepare yourself to have your mind and ears rocked. That being said, most of you will choose the lossless Dolby TrueHD 7.1 MA mix or the Dolby Digital 5.1 mix. Both sound amazing, but the TrueHD 7.1 option is the way to go. Talk about fully immersing yourself in this chaotic post-apocalyptic dessert with the sound. Every single sound effect is done with precision and accuracy consistently. Each noise is loud, energetic, and robust, and packs an enormous gut punch every time someone is hit or a vehicle crashes. The gun blasts and explosions are knocked out of the park as well, as it will rattle the walls and your bones. The bass is consistently good and never becomes rocky at any moment. Each sound is layered and well-balanced with some great directionality. The dialogue is always crystal clear and easy to understand, even with everyone’s masks covering their faces. The LFE is excellent and the dynamic range is extremely wide here, leaving this audio presentation with perfect marks. Also note there are also a few other audio options in other languages as well as the corresponding subtitles. Maximum Fury: Filming ‘Fury Road’ (HD, 29 Mins.) – This is a fantastic behind the scenes look of how it all came together. With cast and crew interviews with virtually every key player involved, they deconstruct how they made this film with using very little CG. They talk about the storyboards, how they filmed the stunts, and the story. They go into detail of the big stunts in the film, all of which were done with real cars, real crashes, and real people. I wish this was even longer. Mad Max: Fury on Four Wheels (HD, 23 Mins.) – Here we focus on each of the vehicles used in the movie, and how they were designed, built, and used in the film. Seeing the cars built and tested was awesome. The Road Warriors: Max and Furiosa (HD, 12 Mins.) – This bonus feature is more or less interviews with Tom Hardy, George Miller, and Charlize Theron as they discuss how they got the roles and put their talent to use and immersed themselves in these iconic characters. Watching Hardy here is hilarious, because he is a huge fanboy of these movies. The Tools of the Wasteland (HD, 15 Mins.) – Here we center on all of the weapons, driving wheels, costumes, and intricate details that went into all of the props, most of which were salvaged from junk yards and forged from metal. And yes the Doof’s guitar is featured here, which was real and shot fire and played music. This was awesome. The Five Wives: So Shiny, So Chrome (HD, 12 Mins.) – This extras focuses on the five wives in the film, who are all dressed in white throughout the film. All of them give interviews and discuss their characters and how much fun they had filming on location in the desert. Fury Road: Crash & Smash (HD, 4 Mins.) – This is more like a promo reel that shows raw footage of some of the bigger moments in the film, which shows us that all of it was pretty much practical and not CGI. Excellent. Deleted Scenes (HD, 4 Mins.) – There are three deleted scenes in total here. They’re fun to watch, but nothing adds to the overall storyline, although there is a naked fake baby in one of the scenes. ‘Mad Max: Fury Road‘ (2D Version) is simply phenomenal. The movie itself is one of the best movies I’ve seen in a long time and is what going to the theater is all about. It;s pure filmmaking at its finest, and I can’t wait to watch this again a dozen more times, because it’s that amazing and fun to watch. Better make it a baker’s dozen. The video and audio presentations are both flawless, and all of the extras are what we all hoped they would be. The bonus features show just how they made this amazing movie, leaving nothing out. This Blu-ray is a MUST-OWN! Blu-ray Review: ‘Mad Max: Fury Road’ (3D Version)!! Film Review: ‘Mad Max: Fury Road’! Blu-ray Review: ‘Mad Max: Fury Road’ Black and Chrome Edition! Mad Max High Octane Collection Arrives In Time For Holidays!!! This entry was posted on Thursday, August 20th, 2015 at 2:02 pm	and is filed under Film, News. You can follow any responses to this entry through the RSS 2.0 feed. You can skip to the end and leave a response. Pinging is currently not allowed. « This Red Band Trailer for ‘Scouts Guide to the Zombie Apocalypse’ Is MAGNIFICENT! We've never lost an American in space, we're sure as hell not gonna lose one on my watch! Failure is not an option.